The final version of the Trans-Pacific Partnership (TPP) was just agreed upon at a big, multinational meeting in Atlanta, Georgia, attended by trade negotiators from the 12 Pacific Rim countries involved in the deal. The TPP, which is supported by President Barack Obama, and whose biggest players are the United States and Japan, has been in the works for about eight years. But its text has not been made available for public consumption, and still has to be put to a strictly yes-or-no vote in Congress before it can take effect. No specific timeline for that vote exists, although according to The Washington Post, Obama legally he has to wait at least 90 days to sign the agreement now that he has notified Congress, and the text must be public for 60 of those days. That means the full text of the TPP might be shown to the public in early November. As we’ve mentioned before, the TPP, like most international trade deals, is meant to enable free trade between member countries. With this particular agreement, Obama hopes to further the United States’ ability to set global standards for trade, rather than allow the agenda to be set by that other economic juggernaut of the Pacific, namely China. The centerpiece of today’s announcement is the fact that the deal will knock out 18,000 tariffs, which is probably good news if you’re a consumer, and definitely good news if you’re a shipping magnate. 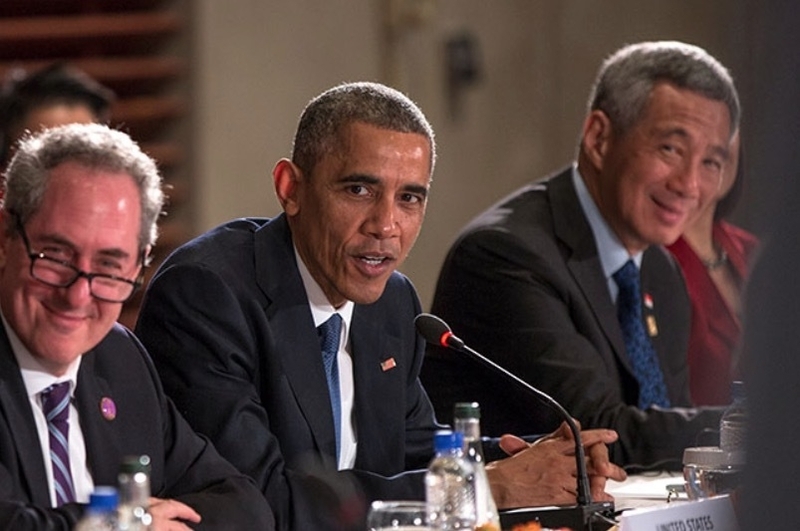 But a few provisions in leaked versions of the TPP have sparked outrage among the public. One such example is the concept of “investor-state dispute settlements,” which allow international companies to bring their grievances to legally-binding tribunals, which could potentially override laws in member countries. The TPP has also raised concerns about a possible overhaul of intellectual property law, as some fear an expansion of US laws restricting companies from manufacturing cheaper generic drugs will keep drug costs up worldwide. While the newly agreed-upon draft remains shrouded in secrecy, the official summary released by the Obama administration this week does address the previous controversy about those two issues, albeit sort of vaguely. Presumably this availability of generics will be helped along by the elimination of “patent linkages,” a provision that scared Politico’s Michael Grunwald when it appeared in a previous leaked version of the TPP. Today, Grunwald tweeted that it sounds like these linkages were “stripped out” of the new version of the deal. The US Trade Representative has also put up a page offering alternative talking points about investor-state dispute settlements (ISDS). In response to critics who claim the ISDS provision would allow international companies to undermine environmental and consumer safety laws in the US, the Trade Representative says the administration has been “upgrading” the agreement, presumably to avoid any such nightmare scenarios. The site also offers a few factoids for context: 51 trade agreements already have investor-state dispute settlements in place; “only” 13 ISDS cases have been brought against the US in the past; and so far, the US has always won. The summary itself is light on details about ISDS, however. But there is a very specific line saying that the tribunals will need to go out the window if the dispute involves “a claim challenging a tobacco control measure of the Party.” In other words, a built-in exemption to TPP means that tobacco companies won’t be among the entities with the power to challenge laws in signatory countries.